Buy Smilelab Teeth Whitening products online at Boozyshop, the teeth whitening webshop! Smile lab was founded in London in 2008 by dentists and a group of creative entrepreneurs. Smile lab is an innovative beauty care brand with a clear focus on design, function and quality. The philosophy of the brand is: "If we can not create a cooler, smarter, easier and better experience for our customers, we simply do not do it at all". 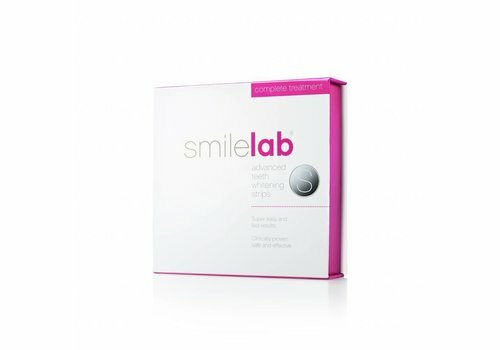 Smile lab is the first brand that has managed to position oral care in the beauty category. In addition, the brand is seen as a permanent part of the beauty regime, because beauty starts with a radiant white smile! And guess what, from now on Smile Lab can also be found in our webshop! Smile lab is a step closer to generating a massive 'smile care' trend. Use the Smile Lab products for a radiant smile with a good dose of girl power! Create that radiant white smile with Smile Lab products! These products from Smile lab are designed in such a way that an immediate effect is visible. This method fits perfectly into that busy lifestyle! No time? Then the teeth whitening products can also easily be applied 'on the go'. In addition, the products have been developed in collaboration with dentists, making the products 100% safe and effective for home use. You do not have to be afraid of side effects and sensitivity issues! Take a look at our range where we offer the best teeth-whitening products from Smile lab. The teeth whitening products from Smile lab will whiten your teeth by removing new and old discolorations. In addition, these products reduce bacteria, giving you cleaner and healthier oral hygiene. The products of Smile lab are completely safe and effective. Do not worry, they will not damage your teeth. It does not hurt to carry the strips for 5 to 10 minutes longer, but when you wear the Smile lab strips for longer, this can cause discomfort. Depending on the product you have chosen, the results will be shown after 2 to 3 whitening sessions. However, there are users who already see results after the first treatment. For long lasting whitening results, it is advisable to finish the entire treatment. How long the result remains depends on various factors. For example, oral hygiene routines and how often you drink or smoke coffee, tea or red wine. In general, the result should remain 6 to 12 months. Read the instructions carefully to avoid unnecessary sensitivity issues or other problems! Order your Smile lab products here at Boozyshop! With the right dental care products your teeth stay in optimal condition. With the products from Smile Lab, which can be found in our assortment, you can safely and effectively whiten your teeth! The products we offer here at Boozyshop are of good quality, so you do not have to be afraid of sensitive and damaged teeth after the treatment. Is the order amount above 30 euros? then you will receive a nice gift from us when ordering. Do not wait any longer and order your Smile lab products here at Boozyshop.